Marco Bruzzone (Genova, 1974) is an artist based in Berlin. He studied Biology at University of Genova and Photography and New Technologies at Bauer Institute in Milano. His work is represented by the Berlin gallery Gillmeier Rech and it’s exhibited regularly in international institution and galleries. Recent exhibitions include: Pollock Gallery, Dallas SMU, Kustverein Arnsberg, Museo Hermann Nitsch, Neaples, Gillmeier Rech, Berlin, Dingum, Berlin, Chateau Shatto, LA, Paradise Garage, LA, Performa 13, New York City, Kings ARI, Melbourne, Tagteam, Bergen, Almanac, London, Ludlow 38, New York City, Isabella Bortolozzi Galerie, Witte De With, Rotterdam, Palais de Tokyo, Paris, Bergen Kunsthall, Bergen, Weneklasen/Werner, Berlin, WIELS, Brussels, Supportico Lopez, Berlin, Kusthalle Basel, OSLO10, Basel. In Vilnius, Bruzzone worked on his series Mosse & Mossette and the preparation for a related book. During this research he disassembled in groups E. Sottsass´Bacterio and produced a set of 31 emojis in the attempt to introduce them to UNICODE. Doing so Bruzzone questioned issues related to appropriation of popular culture and folklore, and (as sottsass mentioned in some of his texts) how this can be used as a control tool by the leading classes. 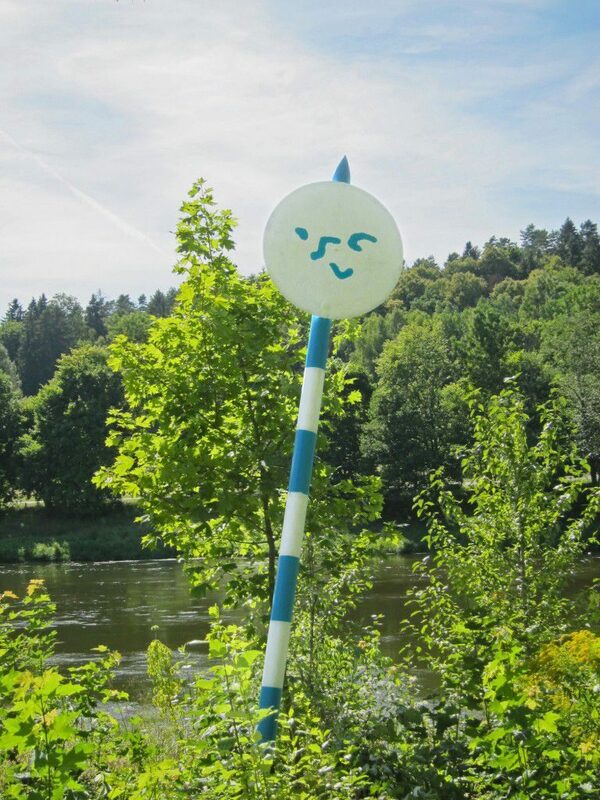 During the last days of his residency, Bruzzone tested one of the emojis producing a 5 m tall three-dimensional public painting in the form of “river-sign”. He restored an old sign along the river Neris, in an old cruising area. A beautiful and lively area he saw many times while running or biking around. Bruzzone, then, organized, in the same place, a pic-nic with all the amazing colleagues and friends he met in Vilnius. The work as been photographed and used as postcard for his exhibition in Berlin Mosse & Mossette (Study for a Set of Emojis after E. Sottsass´ Bacterio).